← A book from blog posts? Since its first entry on the comedy scene in the 1950s, improvisational comedy, otherwise know as improv, has changed the world of comedy. But what does the rise of improv comedy have to do with classroom literacy instruction? As a former elementary school teacher turned professor of literacy education, it has been my observation, in numerous settings over many years, that children often want to be funny in their storytelling. But many are not quite sure how to go about it. And when children do give humorous writing a try, sometimes the result falls outside of what is considered acceptable by the adults in the room and their efforts are met with ambivalence or outright disapproval. Humour is a tricky thing — what some find funny, others find distasteful. Nonetheless, the potential humour has always held — for both entertainment and social commentary — compels me to explore its possibilities for literacy instruction in the elementary school classroom. As part of a recent research project, my team and I spoke with 10 professional comedians in Calgary, asking them how they might approach comedy in the classroom. Almost unanimously, they recommended improv as the best means for helping children find their funny selves, along with a number of benefits. Following their suggestion, we took improv into the classroom, and by doing so, have come to see the brilliance of their suggestions. 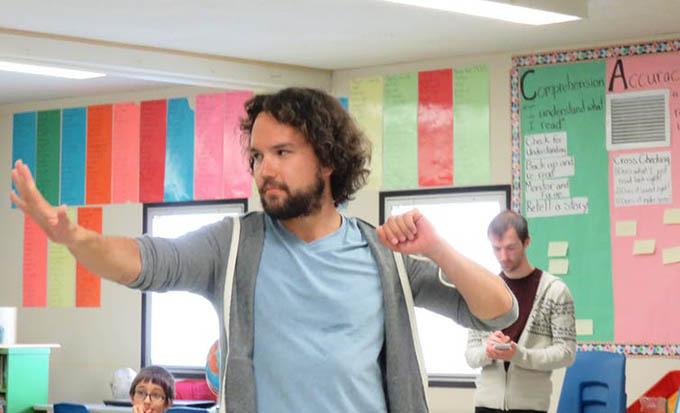 In this article, I explore the benefits of improv to literacy instruction. But first I should be clear regarding my understanding of literacy. I view literacy as much more than the skills to decipher and write words on a page. Literacy involves numerous communication modes — not just reading and writing, but also listening and speaking, viewing and representing. In my work, I also consider somewhat ephemeral aspects of literacy and ask how things such as “affect,” gesture, space, time and improvisation play a role in students’ literacy development. Yes, and… sets the stage for one of improv’s golden rules: Make your partner look good. In improv, there are no fixed or pre-planned ways to end a story — endings depend entirely on what the players bring to the improv assemblage. The collaborative story-building is reliant upon the participation of each player and, at times, it also depends on contributions from the audience. 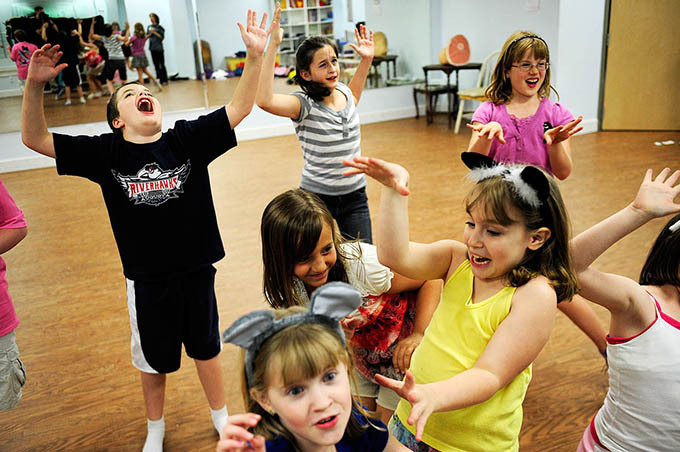 Improv’s yes, and… collaborative ethos provides supports that can be particularly helpful to children who struggle to find ideas for stories, or who are challenged by the prospect of creating interesting endings. It also nurtures a climate in which even the most reticent are encouraged to participate. Learning to tell a story is a critical aspect of literacy development. 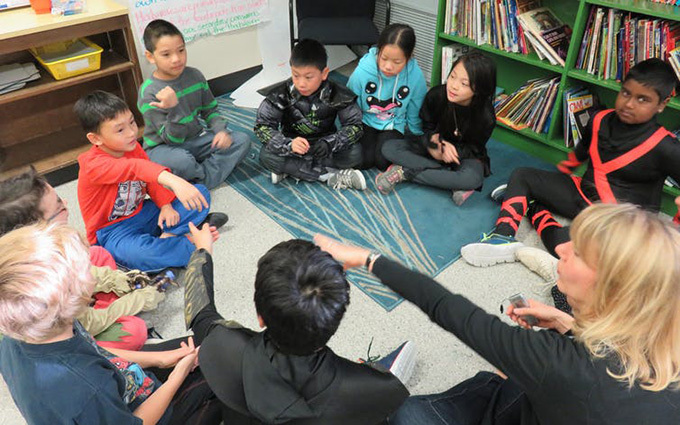 In storytelling, students learn to work with language, vocabulary and writing structures for multiple purposes, such as entertaining, informing or persuading. As students collaboratively play with the story in an improv scene, they develop confidence in using oral language. They learn to make effective decisions about how a story will unfold. Students also have the opportunity to learn from the ways other players use language, gesture and objects to develop the story. Because of the quick pace of improv scenes, some of this learning happens through “affect” — that is, a pre-conscious level of thought that involves the body and the mind. This type of learning, “learning in the flow,” has been shown to be a space where creativity flourishes. When players commit to these principles, they foster cooperation, communication, openness to the ideas of others and flexibility. These outcomes produce an environment that fosters creativity and innovation. Writing teams, such as those at Disney-Pixar, use improv as a part of their story-writing process. For example, as they are developing a story, they might employ the improv game known as Hot Seating. In this game, one player takes on the role of a character in their story while a partner asks questions about that character — for example, how a character feels, or something that happened outside what the partner already knows from the story. Hot Seating develops character backgrounds and allows students to explore character motivations and attributes from different perspectives. Pixar writers might also involve their characters in a game called Raising the Stakes in which a seemingly insurmountable challenge is thrown at the main character, and the writers (now improv players) collaboratively improvise scenes in which the character resolves the challenge. While not yet published, my work with professional comedian Ben Cannon sought to explore collaborative story-building in elementary school classrooms using improv games such as, Monster Tag, Splat!, One Word Story and the Pixar Game, in addition to Hot Seating and Raising the Stakes. Some interesting findings are emerging. As they participated in improv, students showed a growing openness and responsiveness to the ideas of others. Many showed a willingness to take risks and be vulnerable in front of their peers. While doing scene work, students came to see “failures” (when a story doesn’t work or the audience does not find it funny) as opportunities for learning or trying something new. As students moved in and out of new relationships with each other and the story they were collectively building through improvised scene work, they came to see the world in new ways. For example, one group of girls initially set out to tell a humorous story of a “nerdy” pet sitter who neglected the pets in her care. As they played with their story through improv techniques, the girls came to ask why the pet sitter would behave as she did. As they explored this question, the group collaboratively came to a new understanding of social issues and the behaviours of those caught in cycles of poverty. Not only did improv allow the girls to create a better story, it led to important ethical discussions. Returning to the original question of whether improv has anything to do with literacy instruction, the response is an enthusiastic yes, and…. Yes, through improv, children learn how to be funny in their storytelling and… how to take risks and… view failure as a learning experience and… work collaboratively and… think deeply about the choices people make in life and…. Just as it has contributed lavishly to the world of comedy, improv holds many possibilities for literacy education.